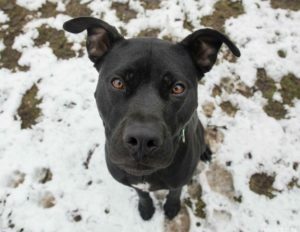 A very sweet dog is making an appearance at Northwest Bank in Buffalo tomorrow as part of Community Week and he’d love to meet you. Jax is a handsome boy who is up for adoption through Diamonds in the Ruff Animal Rescue. Ryanne Smith, a volunteer with the nonprofit animal rescue, will be showing him off. 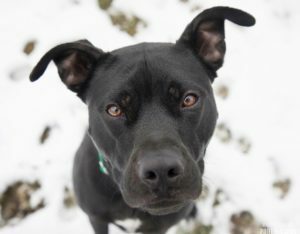 “Jax is the most lovable young boy you could possibly meet! Jax is only 1 1/2. He is so kind and respectful of his surroundings. Jax loves to play with kids of all ages and other dogs of all sizes. We are working on perfect behavior with the kitties. He only wants to play with them, in a lovable way, but we are teaching him that kitties don’t like to play chase. Jax knows all of his basic commands and walks great on a leash. His foster (human) brother is only 9 months old and he knows how to walk next to the stroller like a perfect gentleman. He is crate trained, but prefers not to be created as he is housebroken and is great while left uncrated. Come visit Jax at Northwest Bank, 690 Kenmore Ave., at 10:30 a.m. tomorrow, Friday, April 27. He will be there for about an hour. Maybe more if you’re lucky!